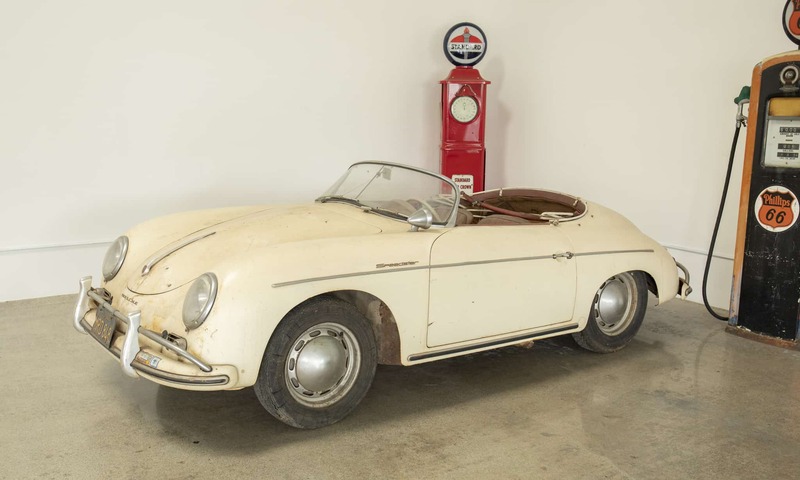 “Survivor”1958 Porsche 356A 1600 Speedster: One owner since new; 100% solid original factory metal; all numbers match; garaged California car. A true barn find from Lincoln, California. Offered exactly as we purchased it, still dusty, not driven since 1986. A true one-owner Speedster is rare enough, but this car has every original panel, all its original components, and zero accidents or rust – ever. Even the original battery box is perfectly solid. The original engine was removed in the 1970’s by the original owner and put aside in his garage so it would never be damaged. The original owner was an airline engineer and Porsche enthusiast, and his property was full of early Porsche cars and parts. This Speedster was his family’s pride and it has always been kept in its original state with the exception of one repaint in the 1970’s. No signs of any accidents or damage ever Interior is original. Original hood was slightly damaged in the 1970’s (kinked by a gas station attendant) and a new hood was installed (the original numbers-matching hood is included and easy to repair). We go to extents to document our cars in pictures and provide the most transparent listings on Ebay. Please study the pictures carefully rather than requesting descriptions. Please complete any inspections or ask any questions prior to bidding or committing to buy the car. Thanks for the interest!